Have I mentioned that I love Bacon? I love Bacon. I love, love, LOVE Bacon. This week my Facebook page reached 100 likes and I decided I was going to celebrate with a really fun meal. Something with Bacon. The recipe over at Artsy-Fartsy Mama struck my fancy (and her blog name made me giggle). I made a few changes to this recipe, to make it my own. 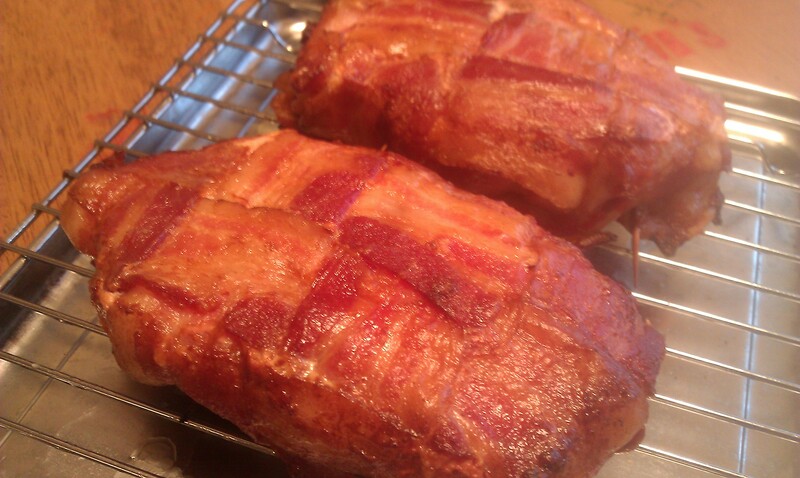 I’ve always wanted to try my hand at a Bacon weave and really liked how well it worked. 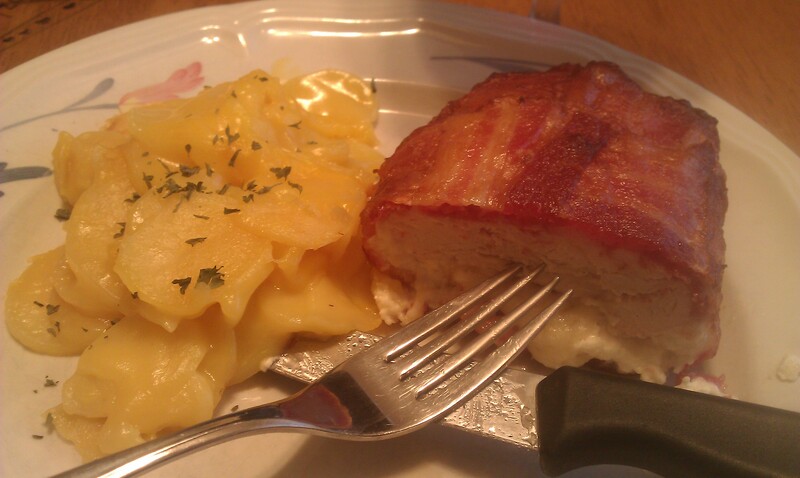 I used eight slices of Bacon in order to make the weave cover my chicken breasts ( I think that it also kept the cheese from seeping out and melting into the pan while they cooked). I used a generous sprinkle of garlic powder on top of the cream cheese, topped it with cheddar and then wove the Bacon over the entire piece of meat. I secured the ends with a couple of longer toothpicks. The recipe said to cook for 45 minutes, turning half way through. I ended up moving the pieces to a grate, set over a pan. It seemed to keep the chicken from getting soggy in all those Bacon drippings. I threw it under the broiler for about 15 minutes after the 45 minutes were up and man, did they ever look amazing. A side of Au Gratin (in our family, we jokingly call them “Old Rotten” potatoes), some Lincoln Peak Marquette and my meal was complete. I usually do a nice big veggie on side of most meals but I was tired after an entire day at work, and knew that I had dessert preparations coming up. Even after cooking them for an hour, the chicken was so moist and tender. The Bacon seemed to keep everything wrapped in tightly. As time consuming as they seemed, I will definitely be making these again. 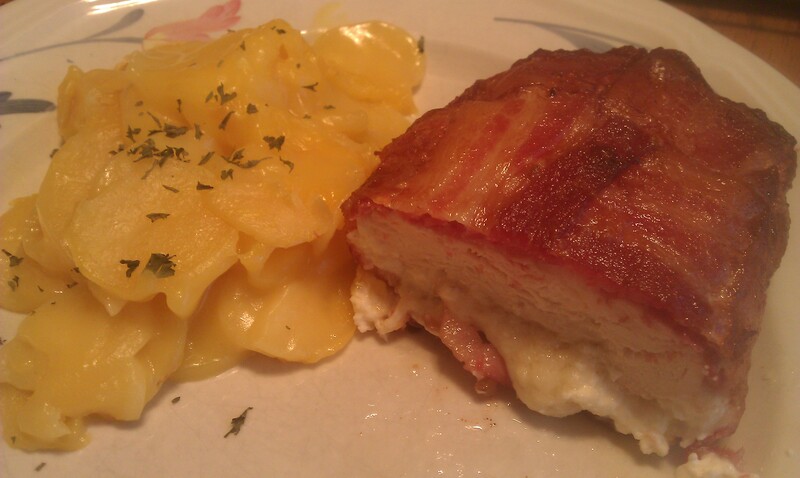 This entry was posted in Bacon, food and tagged Bacon, Cheddar, Chicken. Oh my, oh my, oh my…. That both looks and sounds amazing. I live by the words “wrap anything in bacon and it will be good” but that looks beyond good. I will have to try it. Any suggestions on a specific type of bacon (IE: thick cut, maple, pepper etc)? Let me tell you, it was beyond amazing. I was in absolute Bacon Bliss. I love the words you live by and will have to share them with my friends. 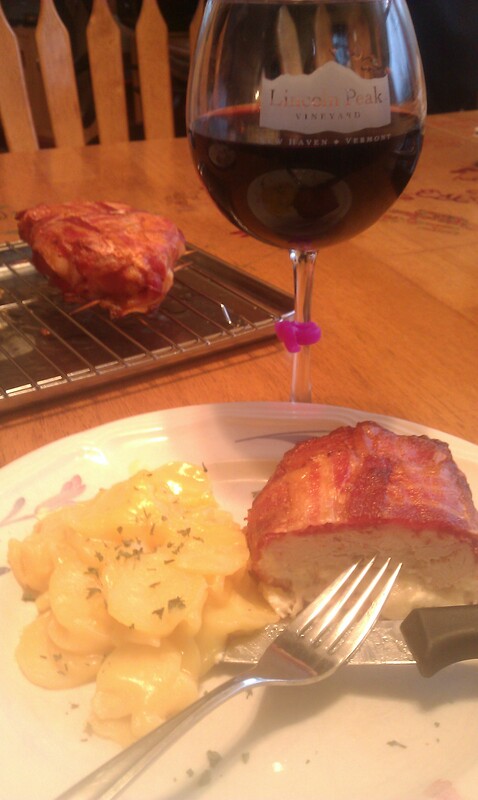 I used Hannafords brand Bacon and did the weave because my chicken seemed a bit too long to cover with two pieces of Bacon. I’ll bet that a Maple Bacon would be just as tasty. I, personally, would avoid the pepper Bacon but only because I really don’t like black pepper at all.